Today was my annual after Christmas cleaning day. After the gifts are all unwrapped comes the fun part, finding room for everything. So I spent the day cleaning, organizing and moving new toys etc. into their proper places. Luckily I had already spent the Sunday before Christmas taking an entire carload of items to donate, so I had made lots of room for new toys. I have always been adamant with my kids that in order for them to receive new gifts they have to donate some of the toys that they don't play with anymore. That way my house stays organized and they understand that donating toys to those in need is a good thing. The one task that I don't enjoy is all the laundry and dishes from guests and cooking. I don't have a dishwasher so everything has to be washed by hand. On a normal day it isn't a big deal, but on the holidays it can be a little overwhelming. Luckily I am on the last load of laundry and then I plan on allowing myself to relax and read a book this evening. I have definitely earned it. Last week I made a number of dishes to freeze for meals this week so I could cut down on my after Christmas cooking. One of the new recipes that I tried was for Spicy Maple Baked Beans from the January issue of Food and Wine magazine. This recipe has 19 ingredients. According to the recipe is takes 3 hours and 30 minutes, 45 minutes of which is active and makes 8 to 10 servings. First things first I do not understand how this recipe states that it takes 3 and a half hours. If you follow the directions it should take no more than approximately an hour and 45 minutes. Maybe they are taking an additional almost two hours to slice the hot dogs, or I am completely missing something. I did have to make a few modifications. I have never been able to find canned navy beans in my area. So instead I used plain white beans, which while slightly different worked just fine. Since I eat gluten free I made sure that the Worcestershire sauce that I bought didn't include wheat. Additionally I used gluten free beer, since regular beer has gluten. I used a dutch oven to cook the beans which worked very well, especially keeping the lid half open. I followed the remainder of the recipe as written. These beans were very popular in my household. My husband thought that they were the best baked beans that he had eaten in a long time and ate multiple bowls. Since the dish had hot dogs, my two boys were quite excited and ate a number of leftovers the next day. The best part was that since it made 10 servings I had enough for a meal last week plus leftovers for an entire other meal after Christmas. 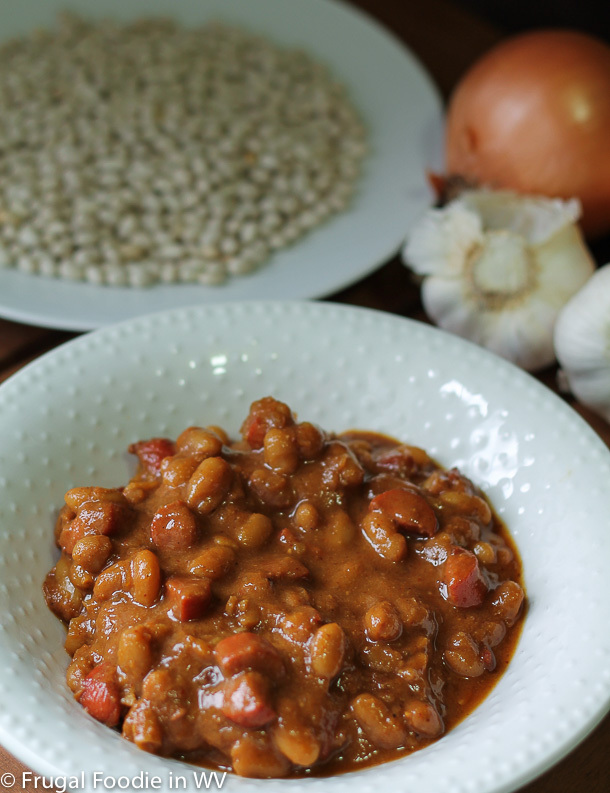 For the recipe go to Spicy Maple Baked Beans. Just stopping over from the Harvest of Friends blog hop! So glad I came across your blog. Now following you on Twitter and Facebook! If you have a moment to follow back, you can find me at http://thesweetspotblog.com. Thanks! Thanks for stopping by, I followed you back on facebook and twitter :) I look forward to your future posts! I don't normally like baked beans, but yours look and sound delicious! Your day yesterday must have been pretty busy! Glad you got to relax and read a book at the end of the day. I like some baked beans and not others :) The canned variety I don't like at all! Homemade though they can be yummy. Thanks for following me back :) Come back again soon! This sounds like a fabulous dish! You sure have been busy with cooking, organizing and cleaning. Even though I have a dishwasher when I put out the good china for the holiday I have to wash it by hand so I know exactly how you feel. Thank you for stopping to visit me and for your lovely comment. Wishing you all the best in 2013. I LOVE baked beans! They are one of my favorite side dishes! I've never tried Maple Beans though. I am going to have to go check out that recipe! I love baked beans also, they are yummy :) Followed you back! Happy New Year to you too :) Thanks for the sweet comment, going over to check out your blog now! Hi there from the Blog Hop! New follower You can find me at http://theresmagicoutthere.blogspot.com/ Your yummy food pics made me hungry!